I tried a new method for a crochet magic ring. 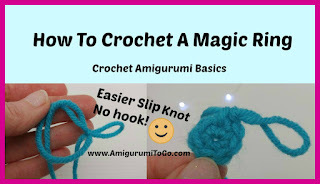 I did try this method years ago but the way the slip knot had to be made turned me off and I never tried it again, until now. I wanted to offer an easier way to make a magic ring so I figured out a way to get that slip knot without using a hook then the rest of the ring comes pretty easy. I hope you enjoy it! If you haven't subscribed already, please do it today! I have many crochet amigurumi videos and many more to come. Don't miss out on new uploads, be sure to hit that little bell icon when you subscribe.